Kristi (a ScrumMaster at my current client) and I were discussing the state of her Agile teams and we started sketching a framework for our discussions — the seeds of this framework were planted by Sandi Keller and Andrew Fuqua (@andrewmfuqua) in numerous conversations earlier this year. We started with the basic aspects that allow companies to “ship frequently and reflect regularly” — a clear, well-defined, and prioritized backlog; a self-organizing team that produces and delivers product every Sprint; and engaged customers willing and able to accept the product iterations and to provide feedback to the product team. As we started delving into each of the aspects, we fleshed out additional attributes for each. For example, certain things have to be in place before we can get to a well defined backlog. These might be a Product Owner (or a PO team that speaks with one voice) who spends time with the customers to understand their pains and needs, a PO who can articulate his (or her) vision of the product, a PO who can work with the stakeholders in prioritizing their needs, a PO who can translate these diverse needs into something that teams can work with, and finally a PO who can collaborate with the team and articulate her vision, the customer and stakeholder needs, and the underlying rationale. A meaningful discussion was more than sufficient for Kristi and I to determine the next few areas to improve on and we didn’t even have to refer to the assessment that my current client has been using. This basic framework was enhanced during additional discussions with other ScrumMasters. I’m not going to regurgitate what’s already in the sketch but would be happy to clarify any areas that aren’t clear. Additionally, I would be interested in other simple frameworks you find useful. The known facts of a situation can be easily overshadowed by feelings, opinions, guesses, fears, concerns, prejudices, hopes, expectations, beliefs, interpretations, assumptions, and myths. That’s a lot to fight against and is it any wonder that so few decisions made are based on facts — facts that match objective reality, are independently verifiable, and are backed up with evidence. As an example, a previous client was ready to initiate a couple of expensive projects to rectify perceived shortcomings in their level of service. We started an A3 for each problem and it quickly became obvious that there were no real (supported by facts) shortcomings/problems to solve. One of those projects was meant to address the perceived slowness in providing daily prices for foreign bonds. The pervasive feeling, within the company, was that they were always the last ones to provide prices while their industry peers were a few hours faster. Facts told a different story — the client was usually in the middle of the pack and once in a while was the last one, but only when there was a special unforeseen event in a particular foreign market (a market that this company specialized in). I ended up losing some potential billing time but received great satisfaction by preventing the client from wasting a lost of time, effort, and money — I think this exchange was ultimately in my favor. Most employees want to accomplish the objectives in front of them, but they often run into what they perceive to be a never-ending series of roadblocks. And frequently these impediments are beyond their ability to fix (based on where they are in the organizational hierarchy). Managers, in an Agile environment, should promptly setup an obstacle escalation process and a mechanism for visualizing the obstacles. In addition, managers should strongly encourage every member of the organization to surface problems affecting the execution of work and the delivery of product. Obstacles, if not readily raised by team members, can be gleaned from the end-of-sprint retrospectives, from failure to meet the Definition of Done, and from interactions with the teams. An obstacle board can be used to track anything that is slowing the team down and is used within an obstacle resolution process. The ScrumMaster in her servant role should do everything possible to remove impediments slowing her teams. She is accountable for making impediments visible throughout the organization via the obstacle board. At a previous client we instituted a process wherein, an obstacle identified by the team would go on the team obstacle board. If the team and ScrumMaster couldn’t take care of the obstacle within 2-3 days the visibility of the obstacle would get escalated from the team, to the immediate managers, then to the senior managers and directors, and finally to the Vice Presidents. Obstacle status was displayed on large video screens throughout the campus. At each escalation stage, if the obstacle was not resolved or if a workaround was not found within 2-days, the ScrumMaster would move the obstacle up to the next higher level board. The ScrumMaster did not own the obstacles; managers did and they agreed on ownership of the obstacles amongst themselves. Quick escalations ensured that people higher up in the organization were aware of issues the teams were struggling with and had an incentive to remove the roadblocks quickly. Obstacles would only be considered “resolved” when the ScrumMaster and the team accepted them; nobody else could remove an obstacle from any of the boards. Some obstacles were impossible to fix in a few days — for these, people higher up in the organization were accountable for explaining to the team why the obstacle couldn’t be solved now, what they were doing about it, and by when they expected closure on the item. For obstacles that management could not solve or help with and for which the team itself was best placed to solve the problem, the obstacle would be returned to the team. Even though management was unable to fix the issue they were now aware that a problem existed and could help the team with resources, etc. This simple process increased visibility dramatically and team members realized very quickly that they did not have to live with the dysfunctional status-quo — team morale improved as did the sense of empowerment. Company leadership also realized that they had a crucial role to play by removing roadblocks and they didn’t feel left out as most do when switching to a poorly run agile transformation. Why do managers assume the problem is with the team or teams? Remember, half-a-century ago, Deming pointed out that 95% of the problems are systemic problems. And guess who is responsible for the system? It’s easier to blame others than to take the time to reflect and introspect about how we ourselves are creating the conditions for these problems to come into being — problems we then keep complaining about. Why do managers (and team members as well) not spend a few minutes thinking about what the problem really is — the root cause and not just the manifestation — before leaping to conclusions? In this case, there are numerous things that could be keeping the teams from meeting their commitments — lack of skills, lack of appropriate training, over specialization, silos, handoffs, interference from without within the sprint, pressure to commit to more than appropriate, changing priorities, lack of alignment with other groups these teams may be dependent on, technical debt, dearth of testers, large batches with little flow — stories being delivered towards the end of the sprint, large stories, unclear stories, unnecessary steps, non-value add activities imposed on the teams, delays and waiting, and so on and so forth. Without understanding what is actually causing the problem, it’s very likely that you’ll end up solving the wrong thing; thereby, creating even bigger problems. I use a simple diagram to clarify the issue and teach techniques like 5 Whys, Diagram of Effects, ToC Thinking Tools (especially the CRT), etc. 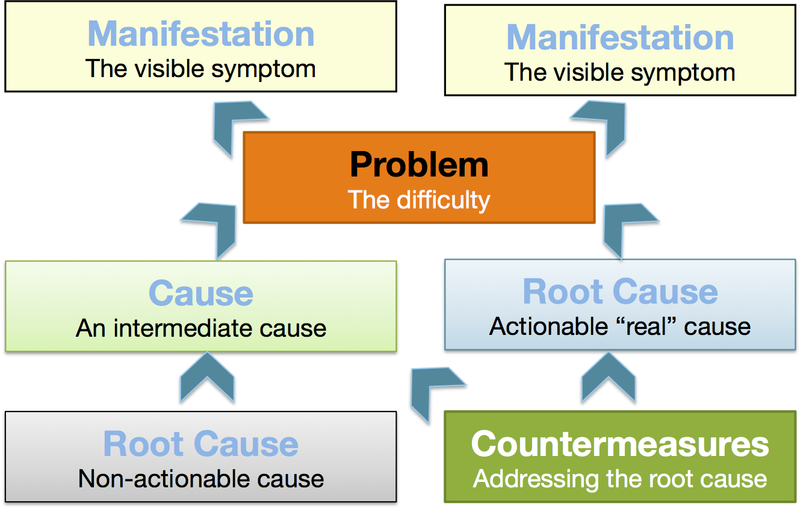 to help teams and managers understand problems and fix root causes so the problem goes away once and for all. How do you handle such situations? Do you have favorite techniques and tools you use? And how much time do you spend teaching problem definition and problem solving techniques? Inside Out — The usual approach is to look at our existing problems (usually operational) and solve them or to look at the existing processes and change them to make them better, faster safer, or cheaper, in order to better serve customer needs. However, the link between the problem being solved, the proposed solution, and the customer need is frequently tenuous and usually based on unshared, unexamined, unproved assumptions. More often than not, the time and effort expended does not justify the eventual outcome. Outside In — Start with the customer’s goals, determine what capabilities we need to meet those goals, and then what actions we need to take to build those capabilities. Actions could be changes in leadership styles, process modifications, or changes in organizational structures, rules, policies, norms, etc. This works really well for organizational transformations. 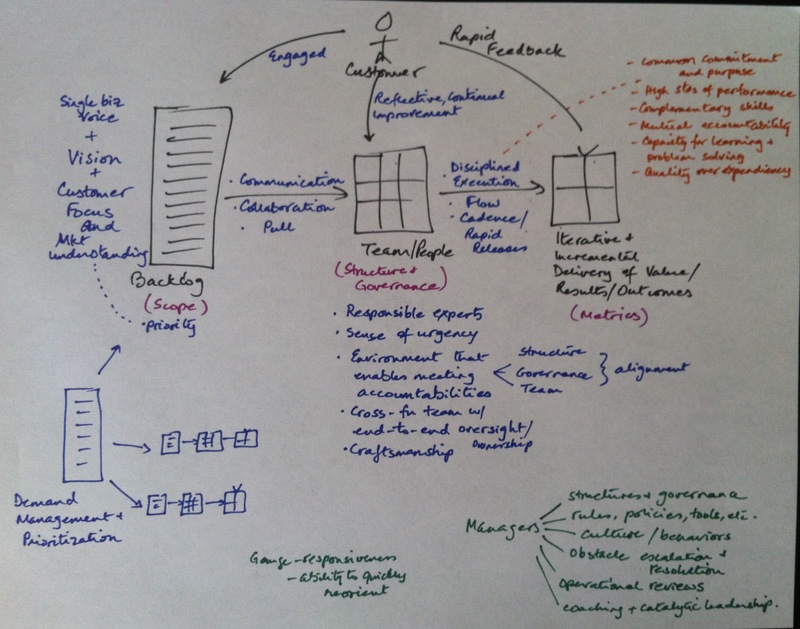 For product development, techniques that can be useful are Gojko Adzic’s Impact Mapping and Tom and Kai Gilb’s Stakeholder Value & Product Quality Requirements defined in Evolutionary Project Management.